PACs, Super PACs And Nonprofits Easily Eclipsed The Spending Of Democrat Gretchen Whitmer and Republican Bill Schuette In The General Election Contest. LANSING (DEC. 10, 2018) — Spending by outside groups to influence Michigan’s 2018 race for governor this fall more than doubled spending by the candidates’ campaigns. The campaigns of Republican Bill Schuette, the state's attorney general, and Democrat Gretchen Whitmer, former Senate minority leader, reported spending a combined total of $10.79 million after the August primary election. Spending by outside groups easily topped the candidates’ total over that period. Political action committees (PACs), nonprofits and other political groups directly spent at least $22.84 million this fall to influence the Whitmer-Schuette race, according to an analysis of campaign finance disclosures and of Kantar Media/CMAG broadcast TV ad-tracking data. The difference between the candidates’ spending and the outside groups’ spending is likely even larger than it currently appears. While candidates had to disclose their spending through the end of Election Day last week, PACs and super PACs won’t have to report on their spending from Oct. 21 through Election Day, Nov. 6, until Jan. 31, 2019. But the numbers already point to a growing trend in campaign finance: outside groups that can raise unlimited amounts of money from donors overshadowing spending by candidates who face limits on how much money they can raise from donors. While tracking the donors to candidates' campaigns is somewhat easy, tracking the donors to outside spenders can be difficult. Some of them don't disclose their donors at all. Some accept money from nondisclosing entities. Adrian Hemond, partner and CEO of the Michigan-based political consulting firm Grassroots Midwest, said institutions, even hastily formed ones, have a fundraising advantage over candidates. Since 2010, a series of court decisions have helped boost the role of outside groups in elections nationally. Those decisions include Citizens United, in which the U.S. Supreme Court banned limits on political spending by corporations and labor unions that’s done independently of candidates' campaigns. So far, groups have disclosed spending about $11.85 million on independent expenditures to directly influence the general election race for governor. The number will go up as more disclosures become available. Other groups ran ads that didn’t expressly tell people how to vote, so they didn’t have to report their spending totals to the state. These so-called “issue ads” typically either criticized or promoted a candidate. MCFN tracked an estimated $10.98 million in unreported spending on broadcast TV ads involving either Schuette or Whitmer after the primary election, according to analysis of Kantar Media/CMAG ad-tracking data.The total doesn't include the nondisclosing groups' spending on cable ads, mailers or digital ads. The last time Michigan had competitive primary races for governor was 2010. That year outside spending in the general election out-paced the candidates’ spending but didn’t double it. The candidates spent about $5.52 million on the general election. Outside groups spent an estimated $8.19 million on the race over that time, according to MCFN's past tracking. Who Were The Biggest Outside Spenders? According to currently available disclosures, the biggest outside spender was a 527 organization called A Stronger Michigan. 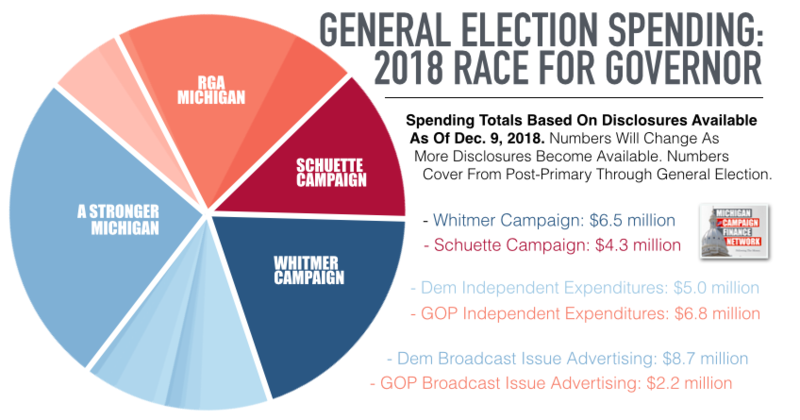 Connected to the Democratic Governors Association, the group, which ran issue advertisements promoting Whitmer or slamming Schuette, aired an estimated $8.77 million in broadcast TV ads in the general election. A Stronger Michigan reports its donors to the Internal Revenue Service. Its biggest donors in 2018 were the Democratic Governors Association ($2.5 million), another 527 called Progressive Advocacy Trust ($1.87 milllion), the United Auto Workers ($1.5 million), Emily’s List ($1.0 million) and the National Education Association ($1.0 million). As an example, Progressive Advocacy Trust, which is connected to the Ingham County Democratic Party, doesn't have to report where its money comes from. The Republican Governors Association’s Michigan super PAC reported spending $4.7 million to benefit Schuette in the general election as of Oct. 20. Its top disclosed donors so far have been Pfizer Inc. ($250,000), Wal-Mart Stores ($200,000), Karen Wright of the Ariel Corporation ($189,999) and Sanofi-Aventis US Inc. ($152,500). 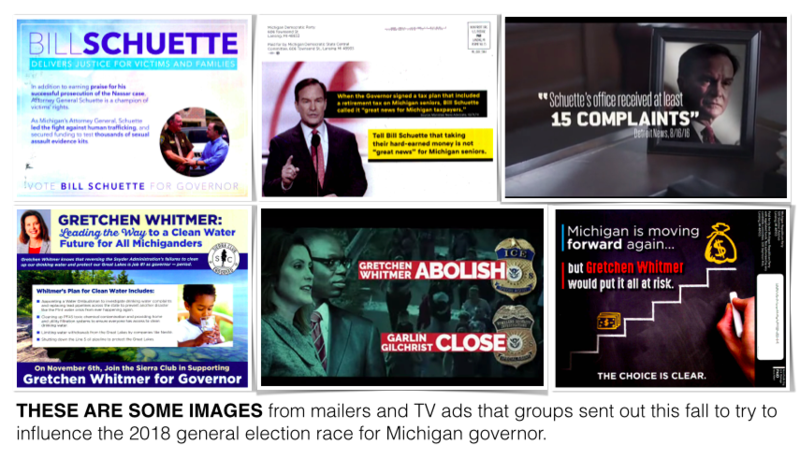 State Solutions, a nonprofit organization connected to the Republican Governors Association, ran an estimated $1.48 million in broadcast TV ads to benefit Schuette. State Solutions doesn’t have to disclose its donors. The conservative nonprofit Americans for Prosperity reported spending $1.8 million against Whitmer from the end of the primary election through the general election. The group spent more money against Whitmer — about $2.1 million more — before the primary. It also doesn’t disclose its donors. Whitmer got a boost from a number of Democratic-leaning super PACs. Super PACs reported spending a total of $5.0 million to benefit Whitmer or hurt Schuette in the general election as of Oct. 20. The Conservation Voters of Michigan, tied to the League of Conservation Voters, spent $1.9 million of that total. Final spending numbers from PACs and super PACs won’t be available until Jan. 31, 2019. At that point, MCFN will update these numbers. MCFN will continue to post stories untangling the 2018 election in the coming weeks. TO SUPPORT OUR CRUCIAL WORK TO FOLLOW THE MONEY IN MICHIGAN POLITICS, CLICK HERE.